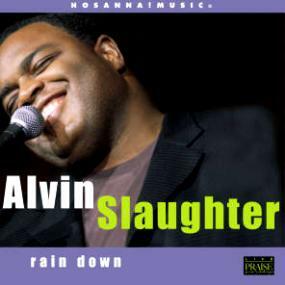 You probably associate Alvin Slaughter with Brooklyn Tabernacle Choir projects. That would be a fair, as he is frequently a soloist with the award-winning Gospel/CCM cross appeal church choir. Get ready to hear him in a different setting. Different flava. New vibe. Hey, you may as well go get your surprise on right now. On Rain Down his third solo project Slaughter offers up some devastingly moving selections, backed by some of the most polished choir power you could hope to hear and with musical arrangements that warrant separate instrumental tracks. With four different locales for the live recording, you hear choirs from Trinidad, from upstate New York, from the campus of Lee University in Tennessee, and top-notch session backing vocalists from Nashville, which is a reflection of the diversity of the styles on the album. Amazingly however, in no way does this project feel disjointed or assembled. It's woven together by the warmth of Slaughter's big voice, and bound by compelling lyrics. While Slaughter certainly has his own style, there are many points on this project where his sound is quite reminiscent to that of Donnie McClurkin. Consider "Speak Lord", written by Bishop Clarence McClendon. Accompanied by a dry, acoustic drum and simple guitar, Slaughter carries the song with a reserved but forceful delivery. Grand choir sounds slam the chorus of "Hallelujah" into the cut. The Gospel flava on this project is enhanced by contributions from experienced players such as Ralph Lofton (Hammond B3) and Roger Ryan (keyboards). Often, it goes unrecognized how important the small touches are; the finger mastery that these two in particular bring to the table, with delicate flairs and appropriate nuances, is a major reason why this new sound from Slaughter works so well. The select group of four of session singers (Lisa Bevill, Michael Mellett, Chris Rodriquez and the fabulous Wendy Moten) blend worshipfully together, this being particularly evident on "Bless This Time". Perhaps the killer cut is the Slaughter's interpretation of the Dennis Jernigan praise, "Who Can Satisfy". Beginning innocently enough with a free style solo of questions posed by Slaughter, with gentle organ patterns swirling underneath, the kicking begins when the massive choir explodes in response, with the chorus of "There is a fountain Who is a King...". The sense-numbing effects continue when the cut progresses into an acappella mass vocal meltdown as everything winds down. Check that. Maybe the killer track is Darlene Zschech's "I Will Run To You", which in Slaughter's honest care, issues you a most powerful anointing. Be sure to catch the moving and poetic spoken testimony on the end of the track. Or maybe it's "Holy Spirit Rain Down", with its wonderful word-painting (close your eyes and you 'hear' the rain gently pour courtesy of the choir's phrasing of the lyric 'rain down'). 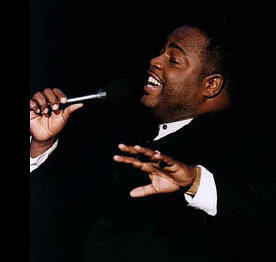 Slaughter doesn't completely jettison his pop/worship approach, as there are a few songs that continue to fill that niche ("I'm Talking 'Bout Jesus", "I Believe The Promise"). Do yourself a favor, and don't dismiss this album as something out of your pre-defined bounds. You'll be happily surprised to find that Alvin Slaughter is actually a perfect fit. All content in GospelFlava © copyright 2000. No information to be reprinted or re-broadcast from this site without the expressed written consent of GospelFlava.com. All rights reserved.